Places in the heart of populated places that are forgotten, or hard to reach. Independent British site offering information, contact and discussion on issues related to deafness and sign language. Website that accepts submissions of photographs of sign assemblies whose numbers can be arranged to form a mathematical operation. An artist who loves to travel shares experiences through travelogues from places around the world. Ongoing travelogue from the United States and Greece, including favorite places to see and best places to eat. A guide to places to go and things to do on a motorcycle. Gear reviews, calendar and message board available for interaction with other riders. Old and abandonded buildings, industrial places, burned out places. Some may be creepy looking but anything which has been pretty much forgotten and left to decay. Three week adventure to such places as Amsterdam, Vienna, Budapest, Venice and Barcelona. Gives suggestions on places to visit in each country and what to take. Travel to the worlds least enchanting places. Simon Bones ongoing project to document places in transition from authoritarian rule. Includes destination, equipment and boat reviews, links, message forum, store, and summary of Boats and Places TV telecasts. For photos and comments on places that are known to be haunted or scary in and around Kentucky. CARFs photo blog. Places forgotten by society. Database of places to skate with zip code distance finder. Group to post photos of favourite historical places. Photographs of places that are deserted by the people that used to live or work there. Exploring the abandoned, haunted, historic, and psychotic places in Jersey and surrounding areas. There are also some write ups of haunted places across America. Sharing photos which show the interesting aspects of abandoned places, buildings and things. Urban exploration team from Cleveland, Ohio. Exploring abandoned buildings, tunnels, and other man-made places that youre not supposed to go. Documenting and preserving these forgotten places through photography. Pictures taken in strange places, places pictures should not be taken. Part of a national program to coordinate and support public and private efforts to identify, evaluate, and protect historic and archeological resources. Listings of historic and vacant places. A listing of courses in Tennessee from the Golf Digest 'Places to Play' directory. Includes ratings supplied by panelists, reader comments, and basic course data. Welcome sign collection from a 2000 trip. A project created by a participant. 29 Dannys Dailys The 'Sign' Collection Humorous examples. Various views from Florida and South Carolina. If the business hours of Lisa M. Koontz in may vary on holidays like Valentine’s Day, Washington’s Birthday, St. Patrick’s Day, Easter, Easter eve and Mother’s day. We display standard opening hours and price ranges in our profile site. 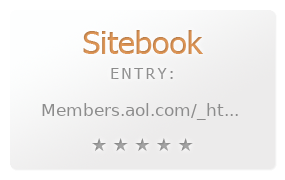 We recommend to check out members.aol.com/_ht_a/lmk1211/WithWings.html for further information. You can also search for Alternatives for members.aol.com/_ht_a/lmk1211/WithWings.html on our Review Site Sitebook.org All trademarks are the property of their respective owners. If we should delete this entry, please send us a short E-Mail.